Get your pizza with a cocktail, starting tonight! Ever thought that Pitfire Pizza would be so much better if only, in addition to its craft beer selection, it had a full bar? The alcohol gods have answered your prayers as the Pitfire Pizza location on Fairfax Avenue has just kicked off a brand-new bar program, helped by the fact that it recently received a full liquor license. Just in time, too, considering Lola’s closure up the street in September undoubtedly left a void for neighborhoodies looking to get their drank on. 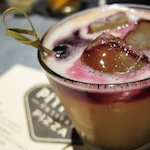 The currently short list of cocktails was created by Steve Garcia, the mixologist behind Pitfire Pizza Costa Mesa’s Pie Society speakeasy bar. But you won’t find Pie Society cocktails up here as he made these special for the location. There are classics like a Manhattan and Gin Martini, three sours (Classic, New York, Boston), a carbonated cocktail on tap (currently it’s Moscow Mule), and three seasonal cocktails. All cocktails are $8 each. For the new program, which uses only fresh ingredients and housemade syrups and cordials, Pitfire hired six new bartenders since now more is involved than pulling taps. Eventually the restaurant hopes to expand the number of cocktails on the menu, but as of right now you can ask for off-menu classics like an Aviation or Mai Tai. To go with the new drinks, there’s a new late-night bar snack menu with smoked olives, plain cheese pizza, and oven-roasted chicken wings that’s available during new extended hours Sunday through Thursday 10 p.m. to midnight and 10 p.m. to 1 a.m. Friday and Saturday. Out of the L.A. Pitfires, the Fairfax Avenue location will be the only one with a full liquor license. The forthcoming Pasadena location will get one, too. Pitfire Pizza, 801 N. Fairfax Ave. #101, Hollywood, 323-544-6240.